Are you looking to spice up your sound with some fancy Delay and Loop tricks? Delay pedals offer very unique and interesting possibilities when it comes to that, while adding refreshment to your sound and naturally enriching it. How Practical Are Delay Pedals? How To Shop For a Delay Pedal? Feel free to compare through all the features the pedals offer, take your pick based on what you want, whether it’s simpler or more advanced controls, modification options, time variations – we got it all covered. Let’s get to it then. Budget friendly option that still brings a decent performance to the table. Complex and versatile solution that gives you a rare level of versatility. Top quality analog delay packed in a simple, yet very attractive package. One of the best budget solutions on the market at the moment. Nearly a perfect balance of great performance, control, versatility and lastly price. Basic delay focused on delivering best performance possible at a reasonable price. Endless possibilities and modeling technology packed into an easy to use package. One of the most iconic pedals revamped with an interesting, new twist. Multi-purpose design that combines everything great from previous popular Boss delay models. One of the iconic delays that many professionals trust to this day. Simple delay that is affordable and punches way above its price range. One of the finest delays that offers impressive control over the tone. Joyo’s D-Seed is a spectacular pedal no matter how you look at it. What makes it spectacular? Let’s put it this way. You get a delay pedal that is built like a tank, comes packed with controls that give you a whole lot of maneuvering space to work with, and all of this at a very reasonable price. Not only do you get to shape the delay effect within standard parameters, but this stompbox comes with features such as Tap Tempo and multiple channels. On top of that, you can also hook it up to an expression pedal, and control the delay that way. 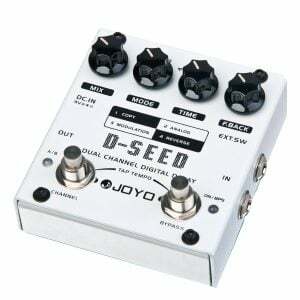 Compared to some other pedals of this type, the Joyo D-Seed Dual Channel Digital Delay (click for review) comes across as a very strong contender. Aside from its hardware solutions and design features, this delay offers one of the most refined effects of this type you can find. At least in this price range. No matter how you look at it, this is one heck of a deal. If there’s one brand that likes to go all out with their digital effects pedals, its TC Electronics. Nova Delay (click for review) is a testament of how much this company likes to innovate, and how much control you can have over a single effect. Its design reflects the early era of digital effects pedals, with its old school red display and LED indicators. In terms of controls, there are so many an average user can easily get lost and confused. 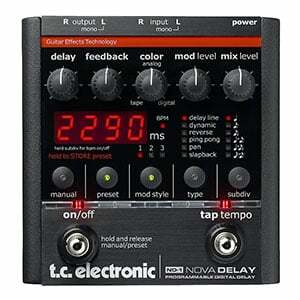 However, someone who insists on having full reign over every single aspect of their tone will find the TC Electronic Nova Delay Guitar Delay Effects Pedal to be a dream come true. The tone is great as well, which is what matters the most essentially. It’s consistent, colorful and pretty organic for such a busy circuit. This pedal is definitely on the more expensive side, but you ultimately get your money’s worth and then some. If you are looking for a delay pedal that can keep up with you, this is it. Affordable and analog don’t often go together. When they do, you can expect some tradeoffs. Whether this ends up being good or bad depends largely on how creative the manufacturer is, and what type of application they have in mind. BBE Two Timer Dual-Mode Analog Delay (click for review) is what an affordable analog delay made right looks like. It’s simple, as you would expect it to be, but that simplicity was done in a way that doesn’t limit its function too much. The entire pedal is built like a tank, featuring high-quality components and great circuitry. Due to the lack of tap tempo, it’s a bit harder to wrangle at first. However, with some determination, it is not that hard to find the way to include this bad boy in your work. If it was just another digital pedal, these properties probably wouldn’t look all that appealing. Once you realize it’s a decent analog stompbox, the whole story gains clarity and sense. When Behringer sets out to design an effects pedal, their main objective almost always efficiency at a low price. While you probably wouldn’t be interested in something that can be described with those words if you’re a world class musician, Behringer’s ideology has its place. Behringer Vintage Delay VD400 (click for review) is by far one of the best delay pedals you can get on a budget. More importantly, it’s an analog unit, so you get that old school delay. When you look at it, the control layout is pretty simple and easy to grasp After all, ease of use is one way to compensate for the lack of advanced features. The range of delay you have access to with this pedal is decent under normal circumstances, but pretty amazing if you consider the price. Those who need a good delay but can’t afford to drop big bucks on more refined models will find a good solution in this Behringer. It is just that good. 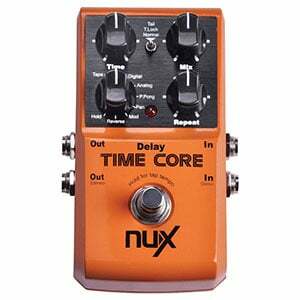 While NUX isn’t the biggest name in the game, they do know how to make a good, affordable digital delay. The thing about this pedal (click for review) that takes most users by surprise is just how many features you get for a bargain price. We are talking mono and stereo I/O, some 7 modes of delay which includes analog emulation, and a set of decent controls to shape it all. All those things we have just listed are far more than you will get in pedals which cost more than this NUX. So, where’s the catch? There really isn’t one. The pedal delivers a balanced performance that is way better than you would expect in this price range and has shown to be pretty decent in various applications. Budget guitar players out there might find a solution for their delay needs in this NUX, which is exactly what this pedal was designed for. There’s no advanced bells and whistles. Time Core get’s the job done without much of a fuss. Analog delays are back in style, and everyone wants to have one. So how do you go about doing that if your budget is super limited? Get something like Donner Yellow Fall (click for review). This is an analog delay in its most basic, purest form. It comes in a tough, compact aluminum enclosure, and features only the bare minimum in terms of controls. However, that is more than enough to dial in a good, simple delay effect which will get you where you need to be. All things considered, this might just be the best affordable delay pedal of them all. As long as you don’t need to have absolute control over your delay effect, you should have a great time using this Donner. The pedal offers a pretty familiar, clean delay which may not be too flexible, but it has that core quality. If you are looking for an easy to use delay which won’t require much adjusting, Donner Yellow Fall is one of the better ways to go. When it comes to top tier delay effects pedals, a rare few come even close to the Line 6 DL4 Stompbox Delay Modeler (click for review). This thing transcends your regular delay stompboxes and takes you to a whole different level. When you look at it, you’ll notice just how busy its control panel is. That’s because you have programmable presets, a very elaborate section for shaping the effect, tap tempo and so much more. This is the type of pedal that is on the edge between pedals and effects processors. You can label it either way. The versatility it offers is almost unparalleled, which makes it perfect for professionals and those who need to have absolute control over their tone. The price is a bit on the expensive side of things, however the performance you get from DL4 is well worth the investment. If delay is one of the effects which you heavily use, something like the DL4 from Line 6 becomes more of a necessity than anything else. Electro-Harmonix rocked the music industry when they first released their legendary Memory Man delay pedal. Just how good this thing is can be seen from the fact that it’s still one of the best in its respective category. Latest Memory Man from Electro-Harmonix (click for review) comes packing a whole lot of features which are delivered in a nice, tidy package. While it’s elaborate in terms of effect shaping controls, Memory Man also sports a number of highly useful features. By this we mean its ability to store presets which you can recall at a later date, or its ability to act as a looper pedal with 30 seconds of recording available. Once you dig under the surface, you really realize the true potential of this pedal. It is simply a very versatile and effective tool that surpasses the realm of delay and opens the door for a whole different type of experience. Those who are looking for a quality piece of gear will appreciate such elaborate design. One great thing about Boss is that you can always count on them to deliver consistent performance. It’s like they have a specific policy they stick to whenever a new pedal needs to be designed, which might not be too exciting, but ensures quality. 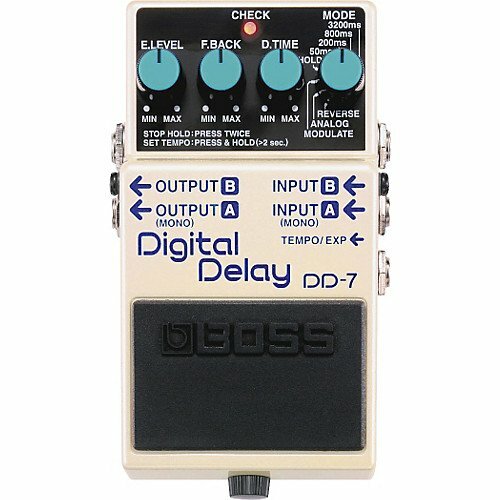 Boss DD-7 is the culmination of all previous Boss delays. They’ve taken everything that was great about Boss delays from the past, and mixed it all up with some new features. That’s what DD-7 essentially is. On top of that, you get a wider range of great delay modes, including analog and vintage. The whole pedal works like a Swiss clock, giving you the type of quality you expect time after time. For the most part, Boss DD-7 (click for review) is priced realistically compared to what it has to offer. This model is a perfect mid-range solution that is capable enough to meet the broadest spectrum of applications. Once again Boss figured out the sweet spot and took full advantage of it. 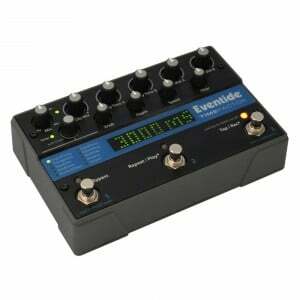 Eventide aimed for the big leagues with the TimeFactor. This thing is so versatile and flexible that it has become a standard piece of equipment in a large number of recording studios. We’re talking about a full blown digital modeling delay which allows you to do anything you want in terms of effect shaping. With 100 presets available straight from the box, and a real true bypass, the type of quality you can expect from this thing is professional grade. TimeFactor (click for review) comes with a loop feature, as well as tap tempo. The best thing about this pedal is great manufacturer support. Software gets regular updates, so your pedal is always packed with the latest and greatest. With that said, the price tag on this puppy makes it somewhat exclusive to those looking for a run of the mill delay pedal. However, it’s an invaluable tool in the hands of a professional. Excellence comes at a price, and in this case, that price is worth paying for. 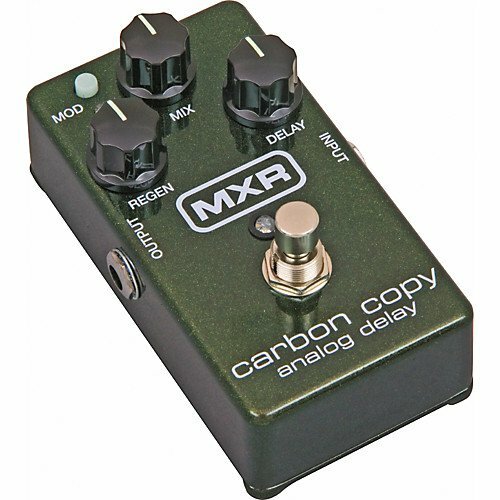 MXR’s M169 Carbon Copy (click for review) has got to be one of the most elegant delay pedals out there. They’ve managed to pack a very capable and authentic analog delay effect into a simple, yet extremely versatile package. The pedal is very minimalist, which is something MXR is known for. Truth be told, there are pedals in its price range which have much more range in terms of modes, but M169 brings that premium analog tone quality. The enclosure it comes is standard MXR box, which we all know by now can take a serious beating. With all new and improved foot switches, you can count on getting a very reliable and constant performance. M169 is capable of handing out up to 600 milliseconds of delay that can be easily shaped using the available controls. Carbon copy is a tool for those who know exactly what they want. It’s a scalpel in the world of sledgehammers, and that is something we have to appreciate. Give TC Electronics a task to build an effects pedal that benefits from digital tech, and they go crazy. This company is known for pushing the envelope of what is possible and acceptable, but they are definitely capable of coming up with true gems. Flashback X4 (click for review) is one mighty delay modeling pedal. This bad boy comes with 16 delay types straight from the box, but it also brings much, much more. You need looping? No problem, you got 40 seconds to play around with. There are three presets and a whole bunch of tone shaping options. If that isn’t enough, there is always TC Electronics’ Tone Print technology to take things to the next level. With this proprietary tech, you can develop your own delay effects using a piece of software. When you’ve made something you like, just upload it to your pedal and you’re good to go. TC Electronics Flashback X4 is truly a force multiplier. Delay in its most basic form, does exactly what you would think, it delays a sound’s release by storing it for a pre-determined amount of time and then releasing it. The stored signal can be outputted several times or played back in to create an echo-like decay effect. Before there were commercial releases of Delay effect “stomp-boxes”, musicians had to simulate these effects using inconvenient specialized rooms. The original first releases of Delay pedals worked through Analog and Tape mechanics, however Modern ones mostly use a digital buffer storage to save your signal for future use. Despite this being one of the oldest guitar effects in circulation, delay is still very much usable. Just like tremolo pedals among others. As a matter of fact, it is one of the most used guitar effects today. If you were to select a random rock song, it would contain the delay effect on one of the instruments. That’s right, delay isn’t only limited to guitars. The reason why the use of delays isn’t always obvious is because it can be utilized in many different ways. Some artists prefer to go all out and swamp their signal with heavy delay, while others tend to add just a pinch. When we move over to acoustic guitars, delay goes from being one of the auxiliary effects to being the headliner. In all honesty, most pedalboards have started out with just a delay and maybe overdrive or something similar. Both of these are such simple, non intrusive and easy to work with effects. To answer the question from the title, delays are very practical. Much like with anything else guitar effects related, there are different flavors of delay pedals to choose from. Your first task is to figure out what kind of delay pedal you need and what kind of budget you have available. Keep in mind that cheap isn’t necessarily bad. A good amount of affordable delays are rock solid in terms of performance. With that said, lets cover three main types of delays out there. Analog delays first appeared back in the ’70s as a way to address the growing demand for this particular guitar effect. Keep in mind that back then your options were fairly limited when it comes to tone shaping and delays were a much bigger part of the whole picture than they are today. Most pedalboards back then had a delay and something such as reverb, both analog. Analog delays use analog circuitry to achieve the delay effect. Most of the time they are fairly simple, extending only the most basic controls. Back in those days this type of pedal was considered to be inferior the moment first digital delays came out. These days, the situation is completely different. There is something about the analog nature of a proper analog delay that you just can’t achieve with their digital counterparts. Next logical question is whether or not you should get an analog delay? If you need just the basic effect, prefer a more organic tone and are willing to pay the price, then this type of pedal is perfect for you. With that said, there are some pretty interesting affordable analog delays out there as well. The advent of digital technologies has had a very large impact on delays just as it did on all other effects pedals. Modern digital delay stomp boxes offer clinical precision at a very low price. These often come packed with various modes, giving you much more room to dial in the perfect tone for your instrument. One issue that people have with digital models has to do with that clinical accuracy. As much as it is good from a practical standpoint, it tends to make your sound fairly robotic. This becomes even more apparent when you really go heavy on the effect. 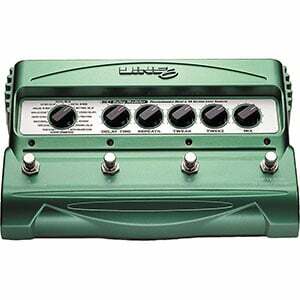 However, digital stomp boxes are cheap, reliable and robust. Those who are just starting out will most likely want to get one of these. Finally, lets mention digital delay processors real quick. These are your top tier units. In terms of tone, versatility and customization, you simply wont find anything better out there. The only real downside is the fact that you will have to pay a premium even for a mid range model. Then again, if you need a delay processor, you are already at a level where cost becomes less important. The very first thing to know about using delays is their placement in the signal chain. Delays belong to the so-called temporal effects category. In other words, they impact the timing of your signal. Therefore, you should generally put them at the very end of your chain. If you want to learn more about order of guitar pedals, check out our dedicated guide on that topic. With that out of the way, lets take a look at the most basic controls you will run into on delay pedals. Level is the most basic control that allows you to adjust how wet or dry the signal coming out of the pedal will be. To put it simply, when the level knob is at its lowest value, you won’t hear any delay. When it is on its highest value, the repeating delay sound will be of the same intensity as the source. This knob dictates how many times a sound will be repeated. Time is where most of the action happens. This knob sets the timing of the delay which is often measured in milliseconds. For example, analog delays generally do go above around 320 milliseconds. On the other hand, digital delays and processors can go way past that mark. Setting the time is what really determines how your delay effect will enrich the overall tone. Controls listed above represent the most basic layout. There are much more complex control interfaces out there. One of the best advice you can get for delay pedals is to take things slow. Make adjustments to the dry tone incrementally. Timing of the delay is where this comes particularly handy as it is quite easy to get lost in stretching those repetitions out. Over time, you will figure out exactly how your delay pedal works with your genre of music and playing style. It also helps to start with a pedal that is fairly simple as you can fully explore the far extremes of the basic controls with no other stuff being in the way. Lastly, it’s all about having fun. Depending on your taste, moving on to a more robust pedal might be a good next step. This is what’s on the menu for Delay pedals so far, we covered some newbie-friendly intuitive pedals, and some wealthy and versatile behemoths. They’ll pretty much cover all your needs for customization and/or simplicity, while providing immaculate sound refinement at very affordable prices. Should you decide to get one for yourself, you might just witness the wonders it can produce, and why it’s such a must have on your pedal board. Feel free to check back here after some time as we will update this list with more Delay pedals suited to your taste. For more great guitar pedals, click here. with fuller delaytime, or cheap housing. components like a lot cheap Asian models. I’d actually but the Strymon Deco above all of these. Same with Strymon’s El Capistan Delay/Reverb. I want to put a delay box on my violin any ideas or suggestions please. I like to play blues.